Ownership / Access: Now a museum. 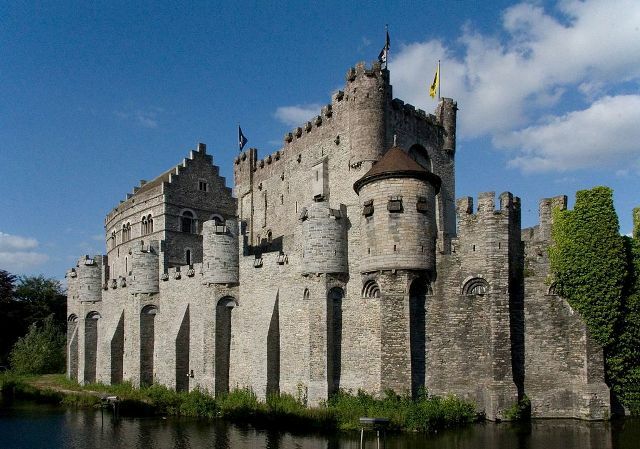 Notes: The Gravensteen is a castle in Ghent originating from the Middle Ages. The name means "castle of the counts" in Dutch. The Gravensteen is situated at an altitude of 9 meters. In 1885 the city of Ghent bought the castle and started a renovation project. The newly built houses were removed and the walls and keep were restored to their original condition. The castle has been repaired enough to allow people to travel through it and climb on top. It is still partly surrounded by the moat. Inside is a museum with various torture devices (and a guillotine) that were historically used in Ghent. The White Queen, a BBC drama series set in the 15th century, used the inside of the castle squares for some scenes and the outside view of the castle with the moat was shown in some short overall views (with some computer modifications to erase modern influences). The castle is also used for the 2015 movie "Emperor", starring Adrien Brody.